Do you guys ever read a story about a film’s concept art and think, "Why didn’t they actually just go with this art instead of that crap I saw?" It’s never a surprise that the images come out well after the film in question has premiered. That’s a problem that really sticks inside the craw of animator and director Jorge Gutierrez, who takes film art very seriously. 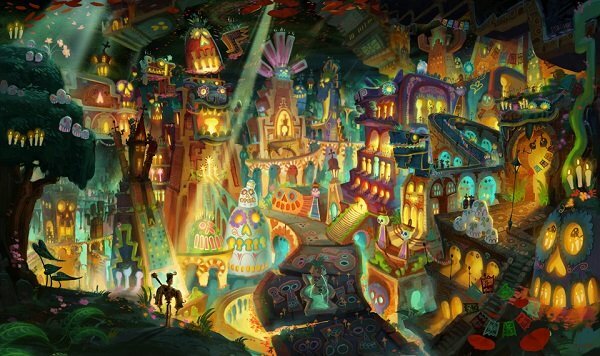 The director recently showed off two stills from his upcoming otherwordly animated adventure Book of Life, from Fox Animation and Reel FX Creative Studios, and if we can expect the entire movie to look this gorgeous, I’d like to buy my ticket already. 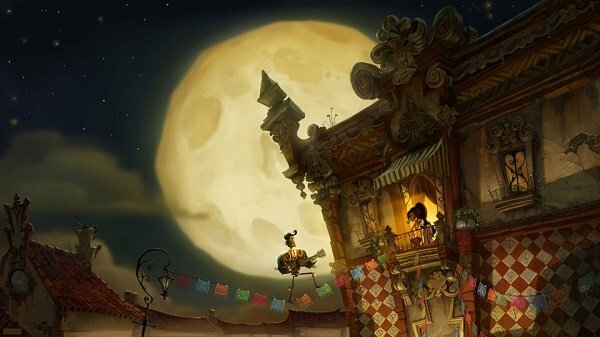 Book of Life is being produced by the visionary director Guillermo del Toro, a filmmaker who is equally motivated by artistic expression in his projects. (Enough so that he even has an artsy coffee table book out.) And it is precisely the similar The Art of… books that give Gutierrez an inspiration to work harder. "The mandate of this movie was: Our ‘Art of’ book is going to look exactly like the movie," he told THR. And every artist poured their heart and soul into that idea." And you can tell, as these images are quite detailed and extremely unique. There’s no way to mix this aesthetic up with the look of Fox’s Ice Age or Reel FX’s Free Birds. It’s just too good for those comparisons. And here’s the second image, which like the first was revealed at an event held at the Ace Gallery in Beverly Hills, where more concept art and paintings were on display. And music from the film could also be heard, which I wish we could get an earful of. The reason for the specific look of the film is that it takes place during the Mexican holiday the Day of the Dead, and centers on Manolo, a young man who thinks his biggest dilemma in life is choosing between his guitar playing and winning the woman of his dreams, all while his family is on his case to go in a different direction. (That'd be him holding the guitar in the top image.) And he "ends up traveling across three different worlds to find himself." That’s what we don’t get enough of in animations these days: different world types. I’d take dangerously inventive films like Coraline over some schlock like Alvin and the Chipmunks any day. Steeped in Mexican art, film and folklore, Book of Life has a sizable cast including Channing Tatum, Zoe Saldana, Diego Luna, Danny Trejo, Ice Cube, Cheech Marin, Ron Perlman, Gabriel Iglesias, and Christina Applegate. You can find it brightening up theaters when it comes out on October 17.